The four-star Macdonald Holyrood Hotel in Edinburgh has appointed Kay Harrison-Mann as its general manager. Harrison-Mann, who has spent over 10 years at Macdonald Hotels, was previously regional general manager of the four-star Macdonald Old England Hotel and Spa in the Lake District. In her new guise, her responsibilities will include promoting the 156-room hotel’s facilities to corporate customers. The venue includes event and conference space for up to 200 delegates, spa facilities, a 14m pool and treatment rooms. She said: "I really enjoyed working at Macdonald Old England Hotel and Spa but after eight years felt I needed an exciting new managerial challenge. Macdonald Holyrood in Edinburgh has provided that very opportunity. "Edinburgh is a beautiful city. 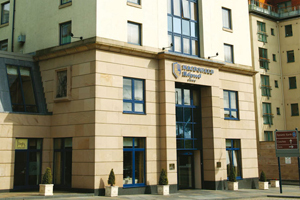 And thanks to the professionalism of the staff and the fantastic facilities at Macdonald Holyrood, this is a hotel that truly exudes warmth, charm and the highest standards of service."